FRIDAY NIGHT… The week is done. Most young couples cannot wait to spend a fun exciting night out together. What does a Friday night look like at the Gamblin household: Sophia and me on the couch watching TV and a conversation that starts at exactly 9:30 PM of who will get McFlurries from McDonald’s. I am a huge ice cream fan. I am not just any ice cream fan I am a Dairy Queen Blizzard fan. It was like a loss to the family when Dairy Queen left Enumclaw in the 1990’s. Every time I drive to work and past the Enumclaw Forest Service building were my beloved Dairy Queen used to sit I get a little weepy. You better believe when I am in Bonney Lake or Auburn and fast food is suggested we are stopping at DQ. So what was the best thing to replace my Blizzard fix? Thank you McDonald’s for introducing the McFlurry. Now my relationship with McDonald’s when it comes to ice cream has been hit and miss. I tried to order a LARGE Mcflurry and I was told that they only come in Small and Regular. I asked can I get it in a large (yeah I am fat and love ice cream I don’t car. That brings me to another point it is funny how people are sometimes ashamed to say they ate at McDonalds. If you see someone you know there they automatically say I don’t want to eat here my kids forced me here while they pound a quarter pounder). Anyways back to my LARGE McFlurry. Thinking that the McFlurry was only offered in 2 sizes didn’t make sense. This is coming from the company that made Billions off the phrase SUPER SIZE me. I was told again that they do not come in Large. Of course I am thinking it is a 17 year old kid (like Eric Epperson was back in high school) is going to do me a favor and give me a large cup. The response I received from my order taker shocked me… “We do not offer Large McFlurries because it is part of McDonald’s plan to fight obesity in America.” I wish I was joking. Normally I am pretty quick to respond with something clever. I was in shocked obviously this was not your typical 17 year old taking my order. I of course was in shock while I took my McFurry. Looking back on it I should have ordered just two regulars and stuck it to McDonald’s. Or I could have just done an Andy Sandberg and threw it on the ground. OHHH YEAH THERE IS A YOU TOP IT FROZEN YOGURT PLACE IN ENUMCLAW. THEY ARE OPEN TILL 11:00 PM ON WEEKENDS & THEY OFFER LARGE CUPS. I was born September 23, 1984 at the Enumclaw Hospital. This picture is of the new hospital. The old one was not as fun to look at, thus the reason they tore it down. Even while Sophia worked there it gave me the creeps. My birth of course was not just any normal day. I was born during a Seattle Seahawks game. The Seahawks beat the Chicago Bears 38 to 9 in front of a home crowd. One person missing from the home crowd was Doctor Gramann who was busy delivering me. Doctor Gramann now doesn’t have to miss any more Seahawks games. After 5,000 child births and 5 Gamblin Children Doctor Gramann is quietly going into retirement. We were really hoping that Doctor Gramann would stick around a little longer to deliver our first baby. Now when our baby is due August 30 we know where Doctor Gramann will be… The Oakland Raiders will be in town August 30 to play Doctor Gramann’s beloved Seahawks. Sophia grew up in Anacortes, Washington. I always give her a hard time that Anacortes is not an island. Anacortes is on Fidalgo Island and I guess by name it is an island, but if anyone has been to Anacortes you know it is not much of an island. Last year we had Sophia’s grandma in the car and she couldn’t stop talking about how much she loves Anacortes. She referenced Anacortes to God’s Country so many times it has stuck with us that whenever we go up to Anacortes we are going to God’s Country. We had a quick 24 trip up to Anacortes to say hi to some family and within a blink of an eye we were back home. It is always a good time when we get together with the Ward crew. Ryan and Megan made the trip up to Washington right before the babies are born. I guess you can say it was the last time we could hang out without changing diapers and putting little ones down for a nap. It was a great trip and we got a few games of Settlers of Catan in. I can only imagine what a game would be like in a year when we have crying babies. Before Ryan and Megan left we had to get some pregnant shots in. As I am typing this blog of course there is an Amber Alert in Western Washington. It seems that kids go missing at a higher rate lately then I can ever remember before. It might be that I am just sensitive because I am going to be a father soon. With a lot of employees with small kids we thought it would be a good opportunity for our dealership and the community to have a kid safety event. The event was for parents to bring in their kids and get profession digital fingerprints and a current photo of their child. All the information went home with the parent so their was no data basing. Time is the enemy when a child goes missing and one of the things that slows professionals in finding children is getting a current photo and fingerprints of the children. After parents visited Art Gamblin Motors they now have a sheet of paper that they can hand right over to officials if their kids go missing. During our Open House Martha Morrissey from Chevrolet surprised my dad and me with our 2011 Chevrolet Mark of Excellence Award plaque. This is a high honor for our dealership as a lot of variables come into play to win this award. Some of the criteria include selling a certain number of Chevrolet vehicles while maintaining a high level of customer satisfaction. 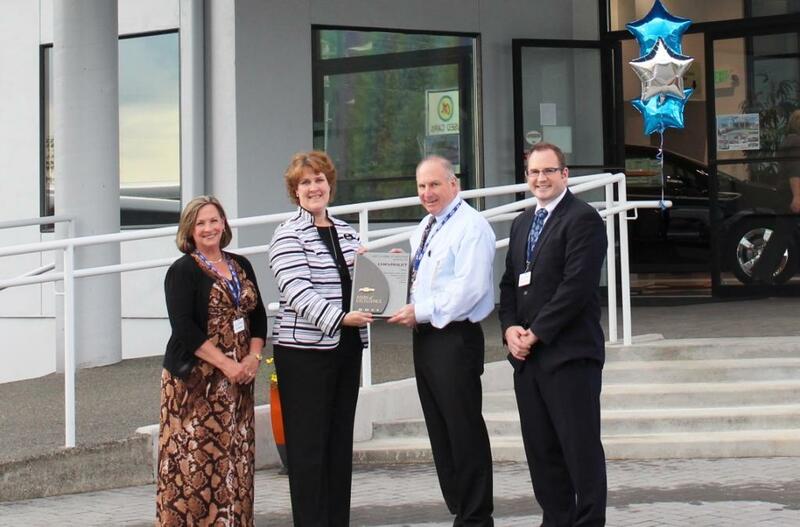 Only a handful of Chevrolet dealers in the state of Washington were awarded the Chevrolet Mark of Excellence Award. Last week we had an open house for the public to tour our re-modeled facility. Not only did we add a nice blue archway, we painted all the interior walls and laid down new tile. One of my favorite additions to the re-model is our covered service area. This allows our service customers to pull into a nice covered area. It was great to have my sister Rebekah in town for the event and the cutest baby in the world Penelope. It is really nice to have all the construction workers gone and now we can focus on going back to work. The new digs really adds a nice inviting atmosphere. If you want to come out and take a look around just stop on in. We had a great showing of guests come through the doors for our event and we had a lot of fun showing off our new dealership.